Surrounded by potted plants and shadeless lamps, a brown acoustic guitar with wear marks and a black sticker with the words “Help Your self” on the front, sits atop the stage in the AC Hub. Sean McCann approached the stage, took hold of the neck of his guitar, releasing it from the stand and then proceeded to play a soft and peaceful riff. The entire room of nearly 80 students and faculty members remained silent as McCann started to talk about his journey to self recovery, all the while continuing the soft tune. 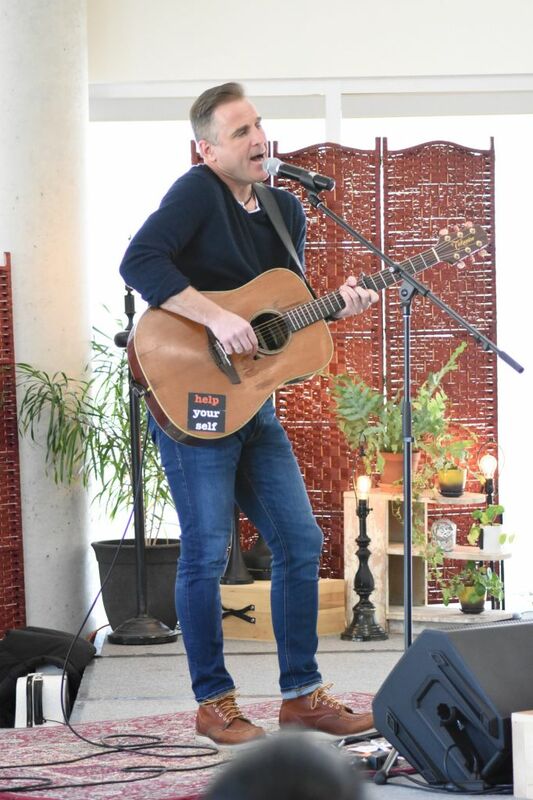 As part of Algonquin’s harm reduction week, Project Lighthouse and the AC Hub welcomed McCann on March 12 for an intimate musical performance and discussion. Once the lead singer of the Canadian band Great Big Sea, McCann now travels with his longest and most dearest companion, his guitar that he named Old Brown. Performing his own songs and inspiring others to speak their truths. “I believe you can defeat a secret by speaking it, and that love can defeat anger. It does. It’s achievable, in a practical way,” said McCann. Prior to his rock star lifestyle, McCann grew up as a Roman Catholic in Newfoundland. At 15-years-old, while he was confessing his teenage sins, a new priest to the parish stopped him mid way and began asking him questions, in hopes to get to know him better. Their friendship grew fast from there. “I didn’t feel uncomfortable. This man was my priest and I felt safe with him. The fact that he was interested in me made me feel extremely special,” said McCann as he addressed the crowd. That same year, the same priest invited McCann to go to Rome with him so he could meet the Pope. Although for him, meeting the Pope was nothing compared to getting a Roman vacation over the summer. “On that trip I got to meet the Pope, in a room with about 200 other teenage boys and their priests. On that same pilgrimage [the priest] also introduced me to cigarettes and alcohol, and he began to sexually abuse me. “I felt alone, trapped and betrayed. I decided to bury that secret and keep drinking. I buried that secret for 35 years, till I finally got the courage to say this song, ” McCann said as he led into playing Hold Me Mother. He eventually left the band in 2013 after realizing with the help of his support system– his wife Andrea — a healthy life and being in the band just wouldn’t work. “I’m not a victim anymore because of the work I’ve done. I moved from victim to survivor. And it can happen to every single one of you, if you do the work,” he said to the audience. Mackenzie Erskine, a mechanical engineer student, was a huge fan of Great Big Sea growing up. She also saw McCann perform last year. “Last year I was in a different place dealing with my own issues. I feel like Séan helped me get through that, so I’m here this year in a whole new mindset. Seeing it in a different light where before it was dark,” said Erskine. McCann knows there’s no quick fix when being the survivor of sexual abuse. His advice to those who are still struggling with coming forward is to accept that blame is not theirs to bear. It sounds simple; it just takes work. He’s been clean of all substances since Nov. 2, 2011. “The return is worth it; people just think it’s impossible, it isn’t. If the Great Big Sea guy can do it, if the Great Big Sea guy can stop drinking and he’s brave enough to say why, then everybody can do it,” said McCann. Previous member of Great Big Sea, Séan McCann brings message of hope, healing to Algonquin Reviewed by Jessica Alberga on March 17, 2019 .